On the afternoon of July 7, 2016, 28 young birders, parents, grandparents, friends, and volunteers embarked on a one-of-a-kind family birding adventure to Colorado. We’d been waiting for this moment since February, so excitement was in the air as we gathered in the breakfast room of the Quality Inn and Suites in Ft. Collins. The scouting reports said birds were active and the weather forecast looked perfect for the weekend. After a brief introduction and distribution of new equipment to the young birders, which included a brand new copy of the Field Guide to the Birds of Colorado (personally signed by author Ted Floyd), a Rite-in-the-Rain Birder’s Journal, and an Iowa Young Birders Nalgene water bottle, we wasted no time and headed out to Gateway Natural Area near Ft. Collins for some foothills birding. Soon after we exited the vans, we spotted a Lazuli Bunting singing in a tree near the parking lot. We quickly set up the scopes for a closer look, and many of the young birders had their first life bird after only ten minutes of Colorado birding! Soon after, a Lesser Goldfinch was found perched on a power line near the parking lot. We continued walking down the trail and were not only greeted by gorgeous views of the foothills, but also found multiple Violet-Green Swallows, Western Tanagers, Spotted Towhees, and Bullock’s Orioles as well as a single Red-naped Sapsucker, Black-headed Grosbeak, and Rock Wren among the other birds. What a great start to our weekend! After dinner, many of us ventured out at dusk to Maxwell Natural Area on the edge of Ft. Collins to listen for Common Poorwills. Unfortunately, the birds were not cooperative and we were unable to add this species to our trip list. On Friday morning, we loaded the vans at 6:30 to begin our trip into the mountains of Rocky Mountain National Park. We traveled to the park on Highway 34 which follows the scenic Big Thompson River. Along the way, we lucked into close-up views of Bighorn Sheep along the highway. Despite being a bird trip, we were just as excited about the mammals! Our plan was to travel up to the alpine tundra (approximately 12,000 feet elevation) for Brown-capped Rosy-Finch and White-tailed Ptarmigan. Our first stop was Lava Cliffs for the Brown-capped Rosy-Finch, and it wasn’t long before someone spotted one on the ground. After quick views in the scope, and a few minutes enjoying the entertaining Yellow-bellied Marmots, we continued up the mountain. Our next stop was Medicine Bow Curve, a regular location for White-tailed Ptarmigan. Despite searching for several minutes, we were unable to locate a ptarmigan. However, views of several White-throated Sparrows and American Pipits were a nice consolation. We headed back down the mountain en route to Endovalley for lunch, with a quick stop at Rainbow Curve to add Clark’s Nutcracker to our list. Upon arrival at Endovalley, we were treated to a fantastic lunch prepared by Linda Bendorf as well as great birds including several Broad-tailed Humminbirds, Stellar’s Jays, and Violet-Green Swallows as well as Hammond’s Flycatcher, Mountain Chickadee, and Western Wood-Pewee. We then moved to the Alluvial Fan area near Endovally on a quest for American Dipper, which was successful. On our return to Ft. Collins we stopped at the Wild Basin Area of Rocky Mountain NP. Although it wasn’t extremely “birdy”, we got fantastic looks at a cooperative Williamson’s Sapsucker and multiple Pygmy Nuthatches. Our last stop was Fawn Brook Inn in Allenspark, a location known to host several hummingbirds, and we were not disappointed. We saw several Broad-tailed and Black-chinned Hummingbirds as well as a single male Rufous Hummingbird. It was a long, but very successful day! We started early again Saturday morning with the Pawnee National Grasslands and a short list of target grassland species on our agenda. We stopped at various locations with the Grasslands and were highly successful, adding Burrowing Owl (including fun views of owlets), Chestnut-collared and McCown’s Longspurs, Lark Bunting, Loggerhead Shrike, Mountain Plover (including a color-banded bird), and Ferruginous Hawk to our list. An exciting part of the day was another fantastic lunch (prepared again by Linda B.) and close-up views of several Common Nighthawks at Crow Valley Campground. On our return to Ft. Collins, we stopped at Fossil Creek Reservoir and were greeted by a cooperative juvenile Say’s Phoebe. We also added several waterbirds to our list including several Western Grebes and a single Clark’s Grebe, a nice opportunity for young birders to see the differences between these similar species. Another great day in the books! Our first stop on Sunday morning was Union Reservoir near Longmont with hopes of adding more waterbirds to our trip list. A family group of Cinnamon Teal, several Yellow-headed Blackbirds, and singing a singing Common Yellowthroat and Savannah Sparrow were the highlights at this location. We then headed for Old South St. Vrain Road, a well-known location for foothills birding. Before arriving there, we made a quick detour to Heil Ranch along Red Gulch Road to see Woodhouse’s Scrub-Jays. Not long after starting our walk down Old South St. Vrain Road, we were joined by Ted Floyd, Editor of the American Birding Association’s (ABA) Birding magazine, author of our new field guides, and Colorado birding expert. It was great fun to bird Ted at one of his favorite birding locations as well as see some of our target birds including Cordilleran Flycatcher and White-throated Swift. We finished our day at Hall Ranch for the last fantastic lunch and a brief presentation by Ted. We also thanked Iowa Young Birders Board Members Ross Silcock and Bill Scheible for their dedication to and support of Iowa Young Birders as the complete their terms on the Board. We have several people to thank for this amazing experience. First and foremost, we thank Carl and Linda Bendorf, who put forth tireless effort to plan a memorable experience and feed us very well! Our volunteer leaders and chauffeurs Ross Silcock, John Rutenbeck, Bill Scheible, and Linda Rudolph made this trip possible and we appreciate their leadership. We are grateful to Ted Floyd for joining us on Sunday and for signing our new field guides. Lastly, we are extremely grateful to the parents and grandparents for allowing their young birders to join us for this weekend of fun with friends and great birding. On June 11, 2016, 20 young birders, parents, and grandparents set out for a warm morning of birding around Lost Island Lake Huston Park and Trumbull Lake near Ruthven in northwest Iowa. Watching the many colorful birds at the feeders near the Lost Island Lake Nature Center including Rose-breasted Grosbeaks, Baltimore Orioles, and Blue Jays had everyone excited to head out into the park. We started the morning learning about birding with our ears from volunteer leader Lee Schoenewe. Lee explained to us that learning bird songs can be a very effective way to find and identify birds, especially during spring and summer months when birds can be more difficult to see. As we walked to a known location of a Baltimore Oriole nest, young birders got to hear the singing male oriole. After viewing not one, but two oriole nests, we continued walking around the new campground at Huston Park. We were treated with views of a stunning Yellow Warbler, a pair of Gray Catbirds, and even were able to see a pair of American Redstarts that may be breeding in the park again this year. After a quick break at the Nature Center, we started down the wooded trail towards the lake. Several House Wrens were singing, and one young birder spotted a female Eastern Bluebird perched low in a tree that offered great looks for all. Two species of flycatchers, an Eastern Wood-Pewee and Great Crested Flycatcher, made a brief appearance and young birders learned about the “sallying” behavior exhibited by this group of birds. More birding by ear allowed us to find a Blue-Gray Gnatcatcher and Yellow-throated Vireo. We finished the morning at Trumbull Lake, a premier shallow lake wetland in northwest Iowa about 3 miles from Huston Park. Young birders quickly realized the bird community was quite different as a result of the different habitat, something we learned earlier in the morning. Trumbull Lake is known for its uncommon wetland birds to Iowa, and young birders were treated with views of Ruddy Ducks, a Western Grebe, Eared Grebes, and a Red-necked Grebe. We also had a Black Tern fly over, and heard a Least Bittern calling from the wetland. Many thanks to Miriam Patton with Palo Alto County Conservation Board and volunteer leader Lee Schoenewe for a great morning of birding in northwest Iowa! You can view our species list for Lost Island Lake Huston Park here and for Trumbull Lake here. You can also view additional photos of our trip by clicking the photo above or here. We had an absolutely fantastic morning for our bird handling event in Ames on May 14, 2016, and 14 young birders and parents were excited to learn about bird handling and banding and about the possibility of holding a bird! We started the morning learning about the techniques and importance of bird handling and banding from our host and volunteer leader Stephen Dinsmore. Dr. Dinsmore shared with us the use of mistnets, a large net made of fine mesh used to capture songbirds (the method we were using to capture birds during our event). He also taught us how to safely hold songbirds as well as take various measurements such as the length of their beak, their legs, and wing cord, demonstrating these techniques on a recently captured Common Grackle. Lastly, the young birders discussed with Dr. Dinsmore reasons why we want to capture and band songbirds and what we can learn from the information, such as tracking migration and other movements, estimating bird survival, and many others. Anxious to see if any birds were in the net, we headed towards the backyard. Dr. Dinsmore had two long mistnets set up around his bird feeders in his backyard. We immediately noticed small songbirds moving about in the net and we quickly worked to extract the birds. Dr. Dinsmore demonstrated to young birders how to quickly and safely remove the birds, removing the feet first, then the wings and the head. In the nets were two Gray Catbirds, a pair of American Goldfinches, a young male Baltimore Oriole, and a stunning male Magnolia Warbler. Young birders were able to assist with removing birds from the net and conducted measurements on the birds once back in the garage. We were excited to hold the birds and view them up close, and safely released them once finished. A few more checks of the nets yielded three more Common Grackles and a Blue Jay. It was an exciting day for everyone! We’re extremely grateful to Stephen Dinsmore for hosting and for sharing his knowledge and experience with bird handling! You can view more photos from our trip here. At the peak of spring migration, 13 young birders, parents, and volunteers spent the morning searching the diverse habitats of Squaw Creek Park near Marion on May 7, 2016. After a brief lesson on migration and a drawing for two lucky winners of a “Sibley Guide to Birds, Eastern Region” provided by the Iowa Ornithologists’ Union, we set off in search of new arrivals. We started off the morning viewing shorebirds on a wetland area near the Red Cedar Lodge. We set up the spotting scope and were able to get great looks at five species of shorebirds including Killdeer, Spotted Sandpiper, Lesser Yellowlegs, Pectoral, and Least Sandpipers. In addition, we saw Blue-winged Teal and a family of Mallards. We then ventured down to a wooded area along a small stream. We were immediately greeted by views of White-crowned and Harris’s Sparrows in a mixed migrant flock, and we continued to chase this flock of birds around for the remainder of our hike. We also observed several other new arrivals including Gray Catbird, Yellow Warbler, Chestnut-sided Warbler, and Eastern Towhee among many others. The keen-eyed young birders were quick to pick out many of the birds as they quickly flitted among the trees. It was a great morning to be in the woods, and we tallied 50 species on the morning! We’re grateful to volunteer Bill Scheible for his leadership and local expertise and to Walt Wagner-Hecht for keeping our trip list, which you can view here. You can also view more photos from our trip here. It was 31 degrees with a brisk 30-mph wind, but that didn’t stop 18 young birders, parents, grandparents, and volunteers from scanning the water and searching the woods at McIntosh Woods State Park near Clear Lake on April 2, 2016. A cold but fun morning it was! We started off the morning braving the wind to scope diving ducks on Clear Lake. Despite the strong winds, there were several birds moving about, and we quickly noticed a group of Lesser Scaup close to shore. Among the Lesser Scaup were two Redheads and several Bufflehead and Ring-necked Ducks, offering the young birders great views of these common diving duck species. A bit of searching with keen eyes also yielded four Double-crested Comorants and a single Common Loon on the far side of the lake. We then moved to a small pond located in the center of McIntosh Woods. There was a small dock and viewing blind on the pond, and all the young birders ventured onto the dock to look at the many dabbling ducks on the pond. Mallards, Wood Ducks, Hooded Mergansers, Blue-winged Teal, and Northern Shovelers were loafing and feeding on the pond at close range, their many colors stunning in the morning light. Here, we learned about the habitat and life history differences between dabbling and diving ducks and even got to look at some of what the dabbling ducks were eating. Next, we focused our attention to the woods to search for migrant passerines. It wasn’t long before we located some migrating Golden-crowned and Ruby-crowned Kinglets flitting about near the trail. Walking a bit further, we saw an Eastern Phoebe foraging along a wooded edge, a first of the year for many adults and young birders alike. As we exited the woods, we were able to see and hear some migrating Fox Sparrows and a Barred Owl, a favorite on the trip. We finished the morning by scoping the lake once more, and were able to see several Common Loons at close range. A great way to finish the morning! We are grateful to Todd Von Ehwegen and the Cerro Gordo County Conservation Board for co-sponsoring this trip and for providing Kaufman Field Guides for all young birder attendees. Many thanks also to our volunteers Carolyn Fischer, Linda Rudolph, and Bill Scheible for their leadership. You can view our bird list here and photos from our trip here. On a gorgeous spring-like day, 12 young birders and nature explorers from Iowa Young Birders and the Junior Explorer’s League of Burlington joined together for a morning learning about hawk identification and watching Bald Eagles on the Mississippi River. We had a very fun morning! We started the morning with a brief program about how to identify Iowa’s hawks and eagles. Young birders and nature explorers learned that in addition to the color of the feathers, size and shape are very important characteristics for identifying hawks and eagles. 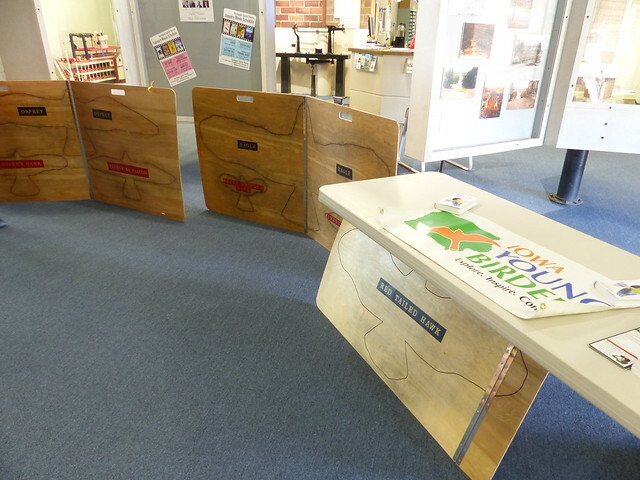 Thanks to hawk and eagle display boards from our friends with the Iowa Department of Natural Resources’ Wildlife Diversity Program, young birders and nature explorers could observe the life size and shape of Iowa’s hawks and eagles, seeing first-hand just how large a Bald Eagle is! Anxious to get outside to enjoy the beautiful weather, we headed out along the Mississippi River to look for Bald Eagles and other birds. We were quickly treated by an adult Bald Eagle soaring overhead and all young birders and nature explorers enjoyed great looks. We took the opportunity to learn about the conservation success story involving the magnificent bird. Bald Eagles continued to fly overhead for the entire morning, a pleasing sight over the big river. We also observed several Ring-billed Gulls foraging over the river and learned how to identify the gulls as well as a bit about their life history. But most importantly, we were enjoying the outdoors on a spring-like day in February! Another great issue of "A Prairie Girl's Notebook", written and illustrated by one of our youth members, Coralee Bodeker. Thanks Coralee for letting us share this on our website! With the high temperature reaching a chilly 3 degrees Fahrenheit, 14 young birders along with their parents and grandparents were excited to spend the morning indoors learning how to sketch birds as part of our first ever Sketching Workshop on January 16, 2016 in Iowa City! What’s even better? We were able to enjoy displays of birds from all over the world at the University Of Iowa Museum Of Natural History! We started the morning exploring the fascinating displays at the Museum, including the one-of-a-kind cyclorama of Laysan Island. Laysan is a small island in a chain of islands north and west of the main Hawaiian Islands and is home to several neat birds, including the well-known Laysan Albatross. Excitement was high after seeing specimens of favorite birds from all over the world! Next, we gathered by a display of songbirds to learn about describing birds based on anatomy, such as a “rusty cap” or “spotted breast”. We also talked about differences in size and shape of many birds. After all, sketching is not only fun, but is also a very useful field tool for documenting birds and identifying them later. We were very lucky to have guest artist and educator Kate Kostenbader join us to share some of her tips on sketching birds. Kate first talked about observing bird behavior and posture, such as what the bird is doing and how it is perched. For example, an American Crow perches on a branch much differently than a Downy Woodpecker perches on the side of the tree, and that will impact how you begin sketching the bird. Kate also shared that a good starting point for sketching birds is to draw an oval as the body, since most bird bodies are oval in shape. Then, you can start to add other parts such as the head, feet, and tail. After learning a few more tricks from Kate, young birders gathered their sketching kits provided by Iowa Young Birders and headed out to sketch some birds in the museum. This was the fun part! The young birders spread out in the entire bird hall and started sketching. Great-horned Owl, Black-billed Magpie, Horned Puffin, Whooping Crane, Baltimore Oriole, Wood Duck, birds of all shapes, sizes, and colors coming to life on paper. Once young birders were finished sketching their birds of choice, we gathered together again and young birders shared with the group the different birds they sketched. Such artistic abilities displayed by all the young birders! We finished the morning by giving away copies of the “Sibley Guide to Birds, Eastern Region” to two lucky young birders, courtesy of a grant from the Iowa Ornithologists’ Union. We are very grateful to Kate Kostenbader for her instruction, leadership, and enthusiasm. We are also grateful to the University of Iowa Pentacrest Museums, who co-sponsored this workshop. And as always, many thanks to the young birders for their keen interest in birds and to the parents for allowing the young birders to join us! On one of the coldest mornings so far this winter, 13 young birders, parents, and volunteers gathered for our final field trip of 2015. Young birders had the opportunity to assist with the Red Rock Christmas Bird Count (CBC). The CBC is an annual event during which volunteers count all the birds they observe in a 15-mile-diameter circle in a particular area. CBC’s are conducted across the world each year by nearly 100,000 volunteers, and the information collected contributes to the knowledge of bird populations. After a brief explanation of the CBC program, the young birders were anxious to do some birding and contribute to bird conservation! Group photo overlooking Lake Red Rock. Not pictured is Walt Wagner-Hecht. Young birders were grouped with volunteer leaders and each group covered a different area of the count circle. As the air warmed, the birds became more active making the birding a bit more exciting. Young birders found many exciting birds including Rough-legged Hawk, Eastern Screech-Owl, Golden-crowned Kinglet, and Harris's Sparrow, and some young birders even saw life birds such as Red-shouldered Hawk. What an exciting morning! At noon, we met at the Red Rock Visitor’s Center to have lunch and compile our species list. After sharing some stories from the morning, we tallied a list of 66 species, which is about an average number of species for the Red Rock CBC. We finished the morning by snapping a group photo overlooking the lake. We were so excited to count birds that this was the only photo we took all morning! Many thanks to Denny Thompson, Kevin Murphy, Steve Dinsmore, and Bill Scheible for helping with this fun and valuable experience for the young birders. We are also grateful to the U.S. Army Corps of Engineers at Lake Red Rock for opening the Visitor’s Center so we could gather for lunch and a mid-day compilation. 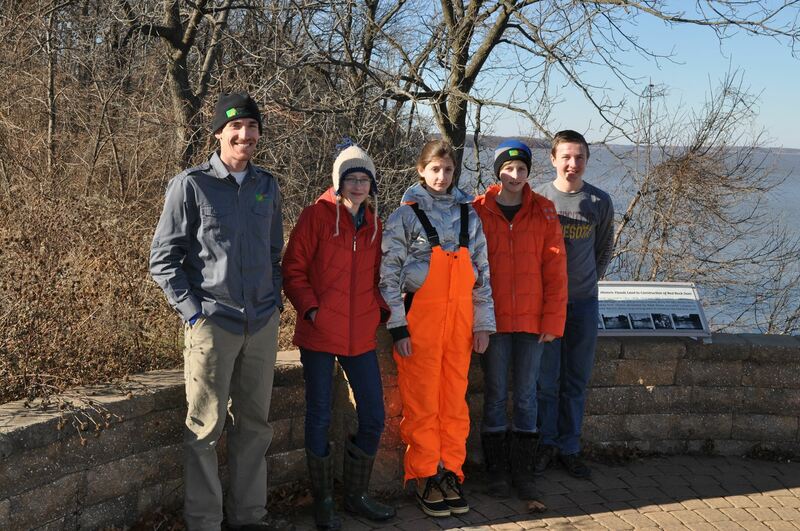 We've had an exciting fall at Iowa Young Birders. Read about our recent happenings here.